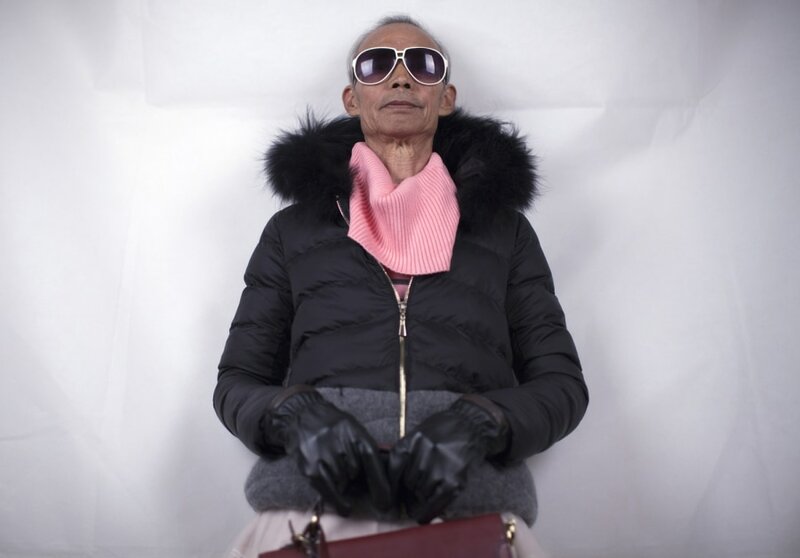 Liu Qianping, 72, also known as "MaDiGaGa," poses during a modeling shoot in the southern Chinese city of Guangzhou on Nov. 24, 2012. Lu Ting puts a wig on Liu Qianping during a modeling shoot in Guangzhou, Nov. 24. Stefanie McIntyre, Reuters — Liu Qianping was visiting his 24-year-old granddaughter in the southern Chinese city of Guangzhou recently when the women's clothes the aspiring fashion entrepreneur was packing into boxes caught his eye. His visit came as the model that granddaughter Lu Ting and four friends had booked for a photo shoot to promote their online fashion business suddenly cancelled, dealing a setback to their new venture. But Liu, a 72-year-old former farmer visiting to escape the chilly winter of central Hunan province, stepped in to help. "I walked into the room and saw them packing up some clothes and I thought they looked quite interesting and quite cute," Liu told Reuters. "So I tried on a jacket and they found it really funny, and I thought it was quite funny. So they asked if they could take pictures of me and post them on the Internet to sell the clothes. And I said, 'why not?'" Liu Qianping is helped during a modelling shoot in Guangzhou, China, Nov. 24. Liu Qianping talks to his granddaughter Lu Ting during a modeling shoot in Guangzhou, China, Nov. 24. A Chinese grandfather is proving love knows no bounds as he models looks to promote his granddaughter's clothing store for teens. The photos went viral after they were posted on the Internet.